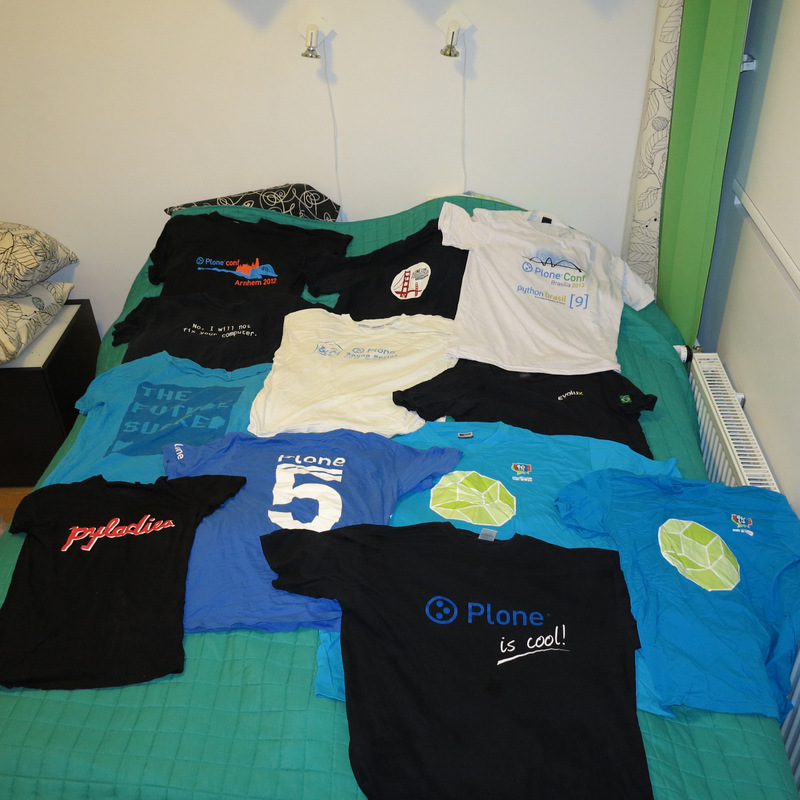 Below is the family photo of my Plone T-shirts, before their utter destruction. Just to keep memory around for the future generations. Some misc. T-shirts mixed in. Though Plone may be sunsetting technology, as Pokemons would say, friends forever. … and then you run this on the serve- side with variable substitutions to get the actual result. Traditionally math expressions are done by writing your own small domain specific language using a custom BNF grammar and a library like pyparsing. You parse the equation and write some kind of evaluation loop, desperately trying cover all cases of nested functions, forward and backward looking of arguments and so on. You can see an example here. However, Python REPL itself is pretty human-friendly calculator. Why to bother do all parsing and evaluation yourself when you just can use Python in Python? The approach presented here is based on the example of Aleksi Torhamo and his Python code verification research. No third party libraries needed. StackOverflow, always so helpful with moderators who understand. Luckily I got a tip towards solving this privately. I kindly ask you to vote to reopen this question, so that an answer can be posted. The user input is one of the web application attack vectors. It is especially problematic when you let the user to run something, like math expressions, on the server-side – this opens many options for a malicious actors to cause harm. Below I have listed some potential attacks and how to mitigate against them. This is the traditional rationale against using eval(). You cannot simply let the user to run arbitrary code on the server, as they could simply do import os ; os.remove(“/home”). 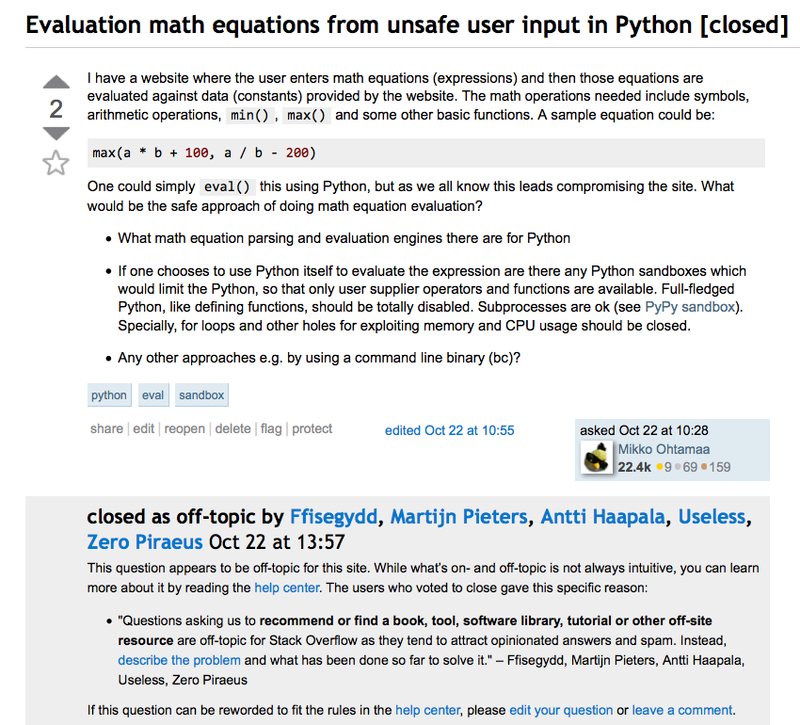 The history of Python has various harded eval and sandbox implementations coming up now and then, but the general advice is that “Python eval() can never be safe“. There are even few nice blog posts dedicated how to escape Python sandbox. Only heavyish multiprocessing approaches, like pysandbox which enforces the security on operating system process level could be considered. In our approach, the trick is that we only do the first half of the eval(). We use the Python compile() function to prepare the Python expression to be the bytecode for evaling. Then, we actually don’t eval(). Instead we use custom opcode handlers and evaluate opcodes in a loop one after another. There cannot be a sandbox escape, because opcodes having should functionality are not implemented. Because compile() does the job of generating the microcode, we are saved from the headache of writing a custom parser. Python dis module helps us minimize the code needed for a stack-based virtual machine. If you let the user to input arbitrary calculations, they can try to make the calculations so complex that your process keeps calculating the math expression forever, mounting a denial of service attack against the service. In Python’s case this means that math with really large numbers can be expensive, as Python 3 allows infinite large integers by default. Initially I was thinking the compile() approach could be easily secured against against such attacks. One could simply limit the input value sizes in math opcodes. But unfortunately it turned out to be little trickier. For example if you compile() Python expression 2**9999999999**9999999 (very big exponent) the Python prompt keeps pushing the bits forever. This is because Python compile() evaluates constants during the compile time, so you are stuck in the compiling step forever. Even if we gap the power operation, which can be easily exploited to generate very large numbers, the malicious actors are quite creative of coming up with other different slow calculations. The only real mitigation for the execution time issue is having the hard limit for calculation time. We do this using Python’s multiprocess module. The calculation is run in a separate child process. This process is terminated if it doesn’t finish timely. In our case, we’ll give 100 milliseconds for the expression calculations to finish. We are also protected against infinite loops. Python compile() allows only single line Python statements, thus for and while are out of the list (even they could be written on a single line). We do not implement looping opcodes either. Memory burning attack is similar to CPU burning attack. Instead of CPU cycles, the attacker tries to run make the process run out of memory. One could input a very long math expression. Alternatively, the power operation could be used to create very large numbers not fitting to the process memory. The example code does not hard limit the memory usage of the child process. This could be done on the operating system level e.g. by capping the maximum allowed child process memory to few megabytes. The main rationale skipping it for now is that I did not (yet) find a nice portable way to do this with Python multiprocess module. Probably the child process could set its own memory cap at the beginning of the process. All tips are welcome. Instead, a naive approach is chosen. The input size and the resulting bytecode size are checked against code size limit. If somebody knows how to make our restricted math operations program to eat a lot of memory please let me know and I’ll test against this too. Below is the sample code. The core code is ~200 lines + extras. The tests at the end of the file and having the timeout decorator consume some lines. If you feel creative and you find a way to destroy this nice piece of code, I’d be interested to hear about the possible attack methods. You can also find the code as Github gist. """Binary operations remove the top of the stack (TOS) and the second top-most stack item (TOS1) from the stack. They perform the operation, and put the result back on the stack.""" stack[-2:] = [TOS1 << TOS] class BINARY_RSHIFT(BINARY):     """Implements TOS = TOS1 >> TOS."""